The Control Panel in Windows is a collection of applets, sort of like tiny programs, that can be used to configure various aspects of the operating system. For example, one applet in Control Panel lets you configure the mouse pointer size (among other things), while another allows you to adjust all the sound related settings. Other applets can be used to change network settings, set up a storage space, manage display settings, and much more. You can see what they all do in our List of Control Panel Applets. So, before you can make any of these changes to Windows, you'll need to open the Control Panel. Fortunately, it's super easy to do — at least in most versions of Windows. Surprisingly, how you open Control Panel differs quite a bit between Windows versions. Below are steps for Windows 10, Windows 8 or Windows 8.1, and Windows 7, Windows Vista, or Windows XP. See What Version of Windows Do I Have? if you're not sure. Time Required: Opening Control Panel will probably only take a few seconds in most versions of Windows. It'll take a lot less time once you know where it's at. Not using a keyboard? Scroll to the bottom of the list of Start options and open the Windows System folder. Tap or click Control Panel from the list. You can now make whatever settings changes to Windows 10 you need to make. On most Windows 10 PCs, the Control Panel opens in the Category view, which sorts the applets into [presumably] logical categories. If you like, you can change the View by option to Large icons or Small icons to show all the applets individually. Unfortunately, Microsoft made it especially difficult to access Control Panel in Windows 8. They made it a little easier in Windows 8.1, but it's still far too complicated. While on the Start screen, swipe up to switch to the Apps screen. With a mouse, click on the downward-facing arrow icon to bring up the same screen. Prior to the Windows 8.1 update, the Apps screen is accessible by swiping up from the bottom of the screen, or you can right-click anywhere and choose All apps. If you're using a keyboard, the WIN+X shortcut brings up the Power User Menu, which has a link to the Control Panel. In Windows 8.1, you can also right-click on the Start button to bring up this handy quick-access menu. On the Apps screen, swipe or scroll to the right and find the Windows System category. Windows 8 will switch to the Desktop and open the Control Panel. 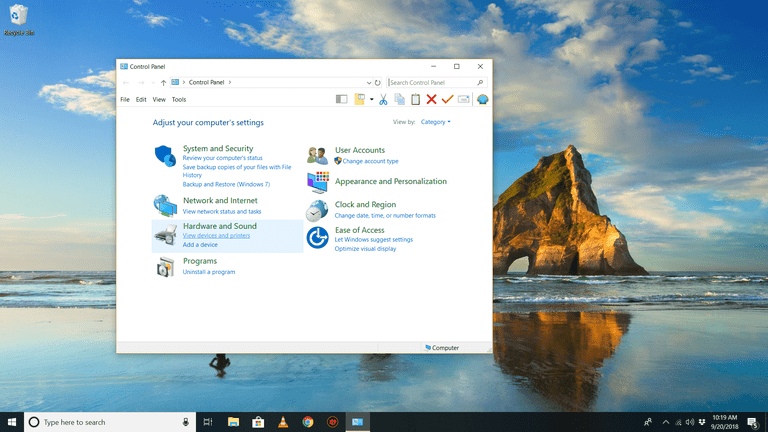 Like in most versions of Windows, the Category view is the default view for Control Panel in Windows 8, but we recommend changing it to the arguably easier to manage Small icons or Large icons view. Do that by selecting Category from the menu at the top of Control Panel, and then choosing an icon view. You should now have full access to the Control Panel. Click the Start button (Windows 7 or Vista) or on Start (Windows XP). Click Control Panel from the list in the right margin. Windows 7 or Vista: If you don't see Control Panel listed, the link may have been disabled as part of a Start Menu customization. Instead, type control in the search box at the bottom of the Start Menu and then click Control Panel when it appears in the list above. Windows XP: If you don't see a Control Panel option, your Start Menu may be set to "classic" or the link may have been disabled as part of a customization. Try Start > Settings > Control Panel, or execute control from the Run box. However you get there, Control Panel should open after clicking the link or executing the command. In all three versions of Windows, a grouped view is shown by default but the un-grouped view exposes all the individual applets, making them easier to find and use. As we mentioned a few times above, the control command will start Control Panel from any command line interface in Windows, including Command Prompt. Additionally, each individual Control Panel applet can be opened via Command Prompt, which is really helpful if you're building a script or need quick access to an applet. See Command Line Commands for Control Panel Applets for a complete list. Another way to access Control Panel applets is by enabling GodMode in Windows, which is a special folder that contains applets from Control Panel. It's not Control Panel itself but instead an easy access folder of the tools found in the program.